The Oratory of San Carlo in San Gemini is an odd looking medieval church, located along Via Casventino facing the central square of the old medieval city where Palazzo Vecchio (the old city hall) is located. At first sight – due to the various aggregations and transformations it has undergone – it isn’t obvious that the building is a church. The church was also known as Santa Maria de Cincercchis or Incertis. For several centuries it functioned as the palace chapel. In its first incarnation, the church was most likely constructed in the 13th century as a small one-room church along the bypass road that ran outside the city walls along the southeast side of the city. This would have pre-dated the 13th century expansion that brought the present-day Via Casventino into a more expansive defensive perimeter. The church might have also been built shortly after this expansion, in conjunction with the new city hall at Palazzo Vecchio. 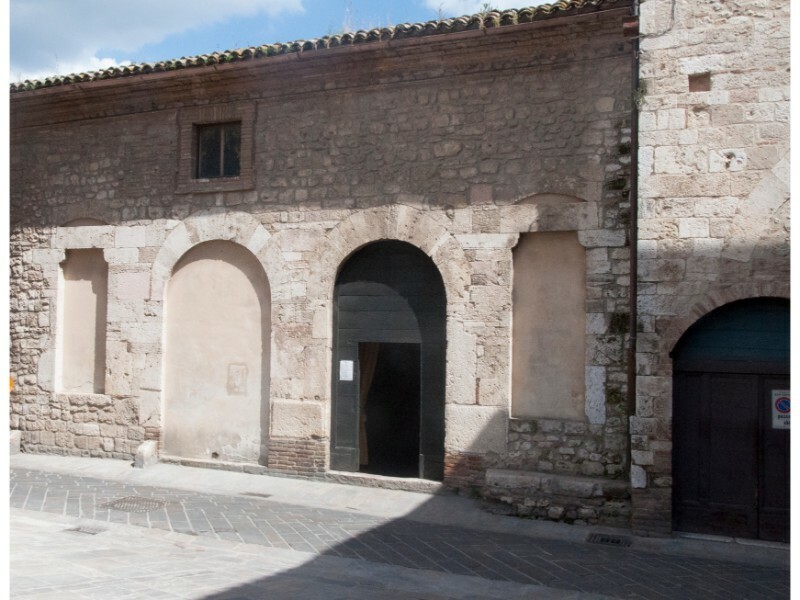 Neither the façade of the original church nor that of the adjacent loggia display traces of Gothic architecture, thus placing their construction before the end of the 13th century. Around the beginning of the 15th century the church was expanded to incorporate an adjacent building that had an open loggia with four open arches. It was common in medieval city squares to have this kind of open loggia. Judging from the quality of the structure of the arches, they could have originally been part of a multi-story public building. The façade of the church is in relatively good condition, but it’s due for a round of maintenance. This will include: cleaning the stone masonry; partial pointing of the masonry joints; and the removal of any inappropriate material, such as Portland Cement mortar joints that can, over time, cause damage to the church structure. The work should take two years to finish, beginning in summer 2014.